“Two research scientists kill five bears” was the headline splashed across the front page of the Tundra Times on April 8, 1966. The perpetrators were Vagn Flyger and Martin Schein, biologists from Maryland who had just spent three weeks on Alaska’s North Slope trying to tranquilize and tag polar bears. According to Flyger and Schein’s own later report, they had in fact accidentally killed only four bears (Flyger 1967: 53). Of the thirty-eight they had pursued by aircraft over the sea ice near Barrow, Alaska, they had managed to hit seven with darts laden with a powerful muscle relaxant, of which four died of overdoses and two were unaffected. The only specimen of Ursus maritimus they managed to successfully tranquilize, tag and release was killed soon after by an Inuit hunter who complained that the dye the scientists had used had spoiled the skin. The study was meant to be the first phase in a long-term project exploring the species’ population ecology, but the bears’ death brought the plan to an abrupt end. Arctic science, Flyger and Schein had discovered, was a difficult and dangerous game. Seeking to build a scientific sensor that could detect threats to the species’ survival, they had proven only that research itself could be a threat. Flyger and Schein had first proposed capturing and tagging polar bears a year earlier, when biologists from the United States, Canada, Denmark, Norway, and the Soviet Union met in Fairbanks for the first international scientific meeting on the polar bear. The meeting was motivated by alarming claims that fewer than 8,000 bears remained worldwide and by concern about the rise of airplane-based trophy hunting in Alaska. The ultimate goal of the meeting, as Alaskan Senator E.L. Bartlett reminded the assembled scientists, was to produce a “machinery to gather, evaluate, and distribute information for the future” (Bartlett 1966: 3-4). Its immediate result, however, was to solidify the consensus that existing estimates of polar bear populations were, as the delegation from Alaska put it, “based on tenuous assumptions and extrapolation of fragmentary data” (Delegation of the United States, 1966: 45). Global estimates ranged from a low of 5,000 to a high of more than 20,000 bears. Although Flyger and Schein moved on, other biologists subsequently improved on their efforts as part of a campaign to collect data and develop population models that would ensure the polar bear’s survival in the face of a rapidly industrializing Arctic. Coordinating their work through the Polar Bear Specialist Group of the International Union for the Conservation of Nature, they eventually met with a large measure of success in both the political and scientific realms (Fikkan et al. 2010). The outrage sparked by Flyger and Schein’s research was only one of many controversies that have flared up around research on polar bears since the initial push for a new “machinery” of surveillance and prediction in the 1960s. 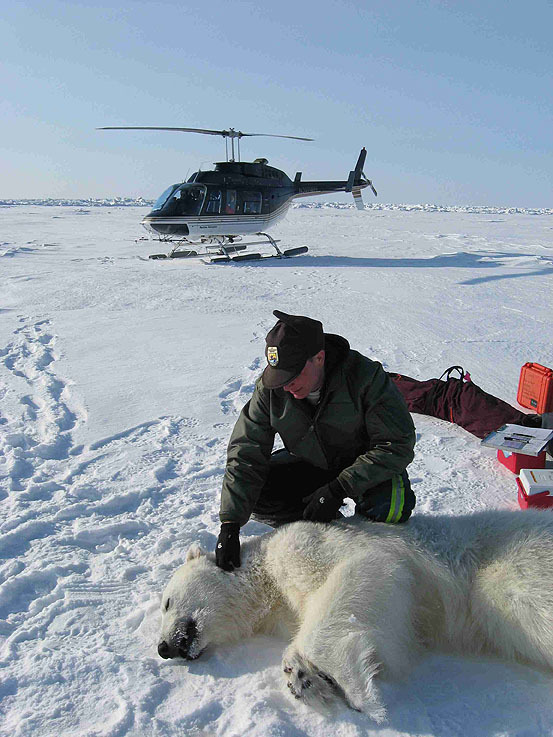 Some of these controversies have centered on the methods scientists use to gather data on polar bear numbers and movements, particularly the use of tranquilizers, tags, and other invasive techniques criticized by many animal rights activists, wilderness activists, and indigenous hunters, albeit for different reasons. Other controversies have centered on the models and simulations biologists have developed to estimate past, present, and future polar bear populations. Conservationists and hunters have often disputed these as producing population estimates that are either too high or too low. Such disputes are in essence fights about the future—not just over different visions of the future, but over the very methods that are used to envision what the future might and should look like. The polar bear’s imagined future has gone through several phases since the alarm was first sounded in the 1960s. By the 1980s, on the basis of tagging data collected by Flyger and Schein’s more successful colleagues, most biologists and conservationists had concluded that the species was under no immediate threat of extinction. The models they used to interpret those data provided the basis for management decisions, including the setting of annual hunting quotas that would not threaten the survival of particular subpopulations. According to these models, certain populations in Canada, which was home to the vast majority of the world’s polar bears, were robust enough to sustain not just indigenous hunting but also a commercial trophy hunt. In 1994, the U.S. Congress, responding to pressure from sport-hunters and Canadian provincial governments and to assurances from scientists that Canada’s bears were being sustainably managed, re-opened American borders to the import of polar bear trophies. This amendment of the 1972 Marine Mammal Protection Act allowed hunters to import nearly 1,000 trophies from Canada in the decade after 1997, when the first permits were issued. The decision was opposed by many environmentalists and animal rights activists, but the machinery of monitoring that polar bear biologists had been building since the 1960s seemed to be functioning smoothly. The language of the ESA has, not surprisingly, opened the door for critics to challenge the Fish and Wildlife Service’s definition of “foreseeable.” The “threatened” listing decision was and has remained the target of attacks by climate skeptics, trophy hunters, and some of Canada’s First Nations communities, who lost a significant source of revenue when the listing put an end to the trophy import program begun in the mid-1990s and who often could see no evidence themselves of polar bear population declines (Freeman and Wenzel, 2006). Some of these opponents have argued that the science of climate change that contributed to the listing decision is fundamentally different from the wildlife biology with which they are familiar—more speculative, more dependent on ungrounded assumptions, more likely to spark what they see as alarmist overreactions, more oriented to the undecided future than to the observable present. Like Sarah Palin, the one-time governor of Alaska and vice-presidential candidate, these critics argue that the designation of the species as threatened with extinction is unjustified because it is based “on uncertain modeling of possible effects” (Palin, 2008). Climate change may be happening and conservation is in any case essential, they argue, but decisions about how to prevent it or adapt to it are best left in the hands of local people and scientists wielding well-established research methods. This is a battle as much over who has the right and ability to predict the “foreseeable future” as it is over which future should be pursued. Because of climate change, the polar bear has once again become the focus of international attention and a symbol for the possible futures of nonhuman life on a human-dominated Earth. However charismatic the polar bear may be, it is easy to wonder whether all of this attention is justified. Many conservation biologists have criticized the popular focus on certain high-profile species to the neglect of broader ecosystems, even as they have cannily deployed pandas, polar bears, and other large, exotic creatures to raise funds and advance their cause (Lorimer, 2007). The uniqueness of the polar bear’s case in epistemological terms might also be doubted. Seen through the lens of the climate wars, the question of polar bear extinction might seem like a minor skirmish that simply replicates, in miniature, grander battles over climate change models, economic impacts, and the fate of the entire planet (Edwards, 2010). All that was particular about the polar bear’s uncertain future might seem now to have been subsumed by the one great challenge of establishing consensus and motivating action to prevent climate catastrophe. The occasional irruption of a scandal over research methods is also nothing new. Determining safe and effective doses of tranquilizing drugs may have been replaced by fine-tuning the parameters of climate models, but narratives about the risks of modernity, the limits of certainty, the hope of staving off unwelcome change, and the necessity of embracing new technologies and scientific methods remain largely unchanged. Moreover, recent calls for taking responsibility for the Earth in the era of the Anthropocene (e.g., Marris, 2011) echo the understanding of “management” advanced by biologists at the Fairbanks meeting fifty years ago. Above all, uncertainty about the future and the eternally deferred hope of a final scientific resolution to that uncertainty remain constitutive aspects of modernity and of the project of conservation, which has always been about preserving valued aspects of the past against the inevitable onslaught of the future.Despite efforts by scientists to shore up their predictions with more data and more robust models, such predictions remain highly disputable—dim and flickering lights in the face of an obscure future. There is no reason not to believe that climate change poses real threats of a novel nature, but there is nothing especially new about the uncertainty it brings, or about the fear that what that uncertainty hides is an unbearable (and potentially bearless) future. Looking back at Flyger and Schein’s ill-fated efforts on the Arctic ice in 1966 and the context in which they took place helps to put today’s disputes over polar bears and polar bear science in perspective. Scientists are stilling trying to produce what Bartlett called a “machinery … for the future” that will make it possible to preserve some of the most valued aspects of the present, including the existence of polar bears. They are still occasionally making mistakes, even if those mistakes are less likely to involve the lethal overdosing of four or five bears than they were in the mid-1960s. Those whose lives may be affected by that machinery are still asking questions about how much it will cost to build, about who has the ability and the right to wield it, and how the information it produces will be put to use. A list of all applications for polar bear trophy import permits can be found here. Amstrup, Steven C., Marcot, Bruce G. and David C. Douglas. 2007. Forecasting the Range-wide Status of Polar Bears at Selected Times in the 21st Century. Administrative Report, U.S. Geological Survey. Available at link. Arctic Institute of North America. 1966. “A Proposal for Research on the Ecology of the Polar Bear,” in Proceedings of the First International Scientific Meeting on the Polar Bear, Fairbanks, Alaska, 6-10 September 1965. Washington, D.C.: U.S. Department of the Interior, p. 59. Bartlett, Edward Lewis. 1966. “Opening Address,” in Proceedings of the First International Scientific Meeting on the Polar Bear, Fairbanks, Alaska, 6-10 September 1965. Washington, D.C.: U.S. Department of the Interior, pp. 3-4. Bernstein, Adam. 2006. “Vagn Flyger, 83; Biologist Was Expert on Squirrels,” Washington Post, January 12. Delegation of the United States. 1966. “The Polar Bear in Alaska,” in Proceedings of the First International Scientific Meeting on the Polar Bear, Fairbanks, Alaska, 6-10 September 1965 Washington, D.C.: U.S. Department of the Interior, pp. 43-54. Edwards, Paul. 2010. A Vast Machine: Computer Models, Climate Data, and the Politics of Global Warming. Cambridge, MA: MIT Press. Fikkan, Anne, Osherenko, Gail and Alexander Arikainen. 1993. “Polar Bears: The Importance of Simplicity,” in Oran R. Young and Gail Osherenko, eds., Polar Politics: Creating International Environmental Regimes. Ithaca: Cornell University Press, pp. 96-151. Flyger, Vagn. 1967. “Polar Bear Studies During 1966,” Arctic 20(1):53. Francis, H. to A.P. Crary, 1967. Box 6, Entry 33, April 7, Office of Antarctic Programs, Records of the Program Director for Biology and Medicine. National Science Foundation, Record Group 307, National Archives and Records Administration, College Park, MD. Freeman, M. M. R. and G. W. Wenzel. 2006. “The Nature and Significance of Polar Bear Conservation Hunting in the Canadian Arctic,” Arctic 59(1):21-30. Godbout, Oscar. 1966. “Scientists to Study Polar Bears Via Transmitters in Orbiting Satellite,” New York Times, June 29. Lorimer, Jamie. 2005. “Nonhuman Charisma,” Environment and Planning D: Society and Space 25(5):911-932. Marris, Emma. 2011. Rambunctious Garden: Saving Nature in a Post-Wild World. New York: Bloomsbury. Palin, Sarah. 2008. “Bearing Up,” New York Times, 5 January.